Last updated Wednesday, 8 February 2017 at 18:18:44. First submitted Wednesday, 8 February 2017 at 18:17:29 by Martin J E Daniels. 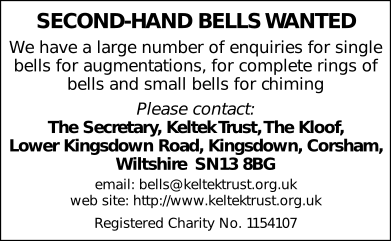 Sent for publication in The Ringing World on Thursday, 9 February 2017 at 09:49:24, and printed in issue 5522, page 179. This performance has been viewed 566 times.